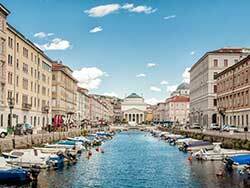 Your client will be hard-pressed to find two cities more indicative of Italian life and arts than Venice and Milan. At Piazza San Marco in Venice, visitors can knock out some of the major sites-St. Mark's Basilica and the Doge's Palace-and still have time to explore the rest of the city. The Rialto Market is a hub for seasonal produce, as well as shoes and wooden toys. Your client can visit the studios of well-known Venetian glass-blowers, take a student-led tour of the city's 15th-century university, or admire the artwork at the Ca' d'Oro, a gothic palace on the Grand Canal. Those who visit Venice during its yearly Biennale festival will be treated to world-class architecture, contemporary art, dance, theater, cinema, and music. From there it's on to Milan, one of the most influential fashion centers in the world. The Armani Silos feature 600 of the fashion designer's signature looks. Those interested in style of another kind will want to check out the Museum of Culture, which houses contemporary art exhibits as well as anthropological relics dating back to 1200 BC. At QC Terme, an 1880s tram-depot-turned-spa, visitors can relax after a busy trip with a soak in the whirlpool.